50 miles is a happy medium sort of a distance: far enough that you have time to enjoy yourself, not so far that it's beyond the reach of even the most novice rider. 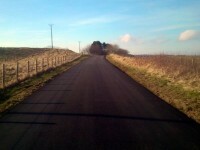 Fifty miles of near-deserted tarmac to the south of Edinburgh, with just a couple of busier bits, and plenty of cake! An Edinburgh loop around the Pentlands - one for the early birds, with ~55 miles, ~2500ft of ascent, bigger roads. Some solid pain, high chance of seeing (chasing?) other riders, some longish pulls but no serious hills.